Archeologists diving on a 19th century shipwreck have brought back a small supply of artifacts they hope will tell them more about the lost Franklin expedition. With youthful enthusiasm, veteran staff from Parks Canada showed off ship’s fittings, copper hull plates, a British marine musket from 1842 and a pair of shoes plucked from the deck of HMS Investigator just eight metres beneath the freezing Arctic waters. The former merchant ship made two voyages to the Arctic in search of Sir John Franklin’s storied expedition, but was abandoned in 1853 after becoming stuck in the once-impenetrable Arctic ice. The ship was found last year in Mercy Bay, off Banks Island in the Beaufort Sea. “I’ve been doing this for over 20 years,” Marc-Andre Bernier, chief of underwater archaeology services, told a news conference Thursday. “This was probably the most phenomenal and exciting project — for all of us. 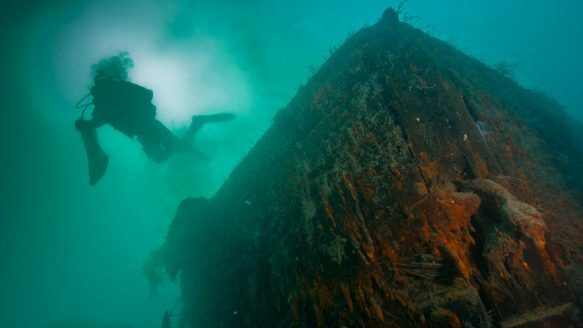 “To dive on that shipwreck that is literally frozen in time ... and having this phenomenal ship in front us standing proud on the bottom with artifacts on the deck was for us totally unprecedented. A team of six divers, including one from the U.S. Parks Service, conducted more than 100 forays, aided by July’s midnight sun, under waters ranging in temperature from -2C to +2C. What they found astounded even the most experienced among them. Artifacts — including the shoes and a bent musket, its trigger guard altered to accommodate winter gloves — lay exposed on the ship’s decks and strewn on the sandy bottom. Divers recovered 16 pieces, primarily to protect them from the ravages of time and ice, and to evaluate their overall condition.